Rain. Thunder possible. High 66F. Winds SSE at 5 to 10 mph. Chance of rain 100%.. Rain and scattered thunderstorms overnight. Low 56F. Winds ESE at 5 to 10 mph. Chance of rain 100%. 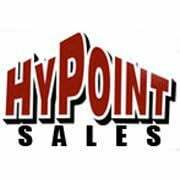 Hypoint Sales specializes in customized electric and gas golf carts. They also sell utility trailers. Brands include Look and Element open and closed trailers. Open daily from 10-5 but call first to make sure office is open.